Ramón Pérez brings Jim Henson and Jerry Juhl’s lost story to life. Is there any making sense of “Tale of Sand”? Is there any meaning to be found in the curious story that spreads out across just over 100 pages? Maybe, maybe not. But sense and meaning aren’t at the heart of what makes “Tale of Sand” such a special work. It’s the whimsical fantasy that readers will recognize as the imagination of Jim Henson. Henson and longtime collaborator Jerry Juhl wrote the screenplay for “Tale of Sand” in the late 60s and unsuccessfully pursued bringing their vision to life on film. For almost forty years the script remained untouched until Archaia Entertainment and the Jim Henson Company worked together to give Henson and Juhl’s script a different opportunity. Possibly a better one at that. After all, what would “Tale of Sand” be remembered for today if the script had been produced? A dated oddity with unusual visuals and a confounding, although overly straightforward, story? Of course, nobody can say for sure, but I suspect that the passing years would not have been kind to Henson and Juhl’s opus. In the able hands of artist Ramón Pérez, “Tale of Sand” has achieved something that would have been near impossible on film: timelessness. Pérez fills each set piece of the story with structures, clothing, hairstyles, and automobiles from eras that span several generations, making it impossible to pinpoint the “when” in which this quirky story takes place. Oh, the story. A man named Mac finds himself in the middle of a party in a small Southwestern town where the townsfolk are celebrating him. Mac is given a map, a set of seemingly arbitrary items in a knapsack and words of luck by the Sheriff who informs him that he’s got a ten-minute head start. On what though, Mac wonders aloud? The Sheriff doesn’t acknowledge Mac’s total lack of understanding of the map, the knapsack or the mission he’s about to undertake and we’re equally befuddled. Whatever he’s about to do, the townies are overjoyed that Mac is their guy and they explode with cheer as he begins his trek across the desert. Mac is pursued by Patch who, for reasons unknown, makes one attempt after another to assassinate Mac during the course of the adventure. A beautiful blonde dame enters the pursuit, as well as a lion, a linebacker and a sheik. Nobody wants Mac to get to… well, wherever Mac is going. Above all “Tale of Sand” is about the imagery. Fantastic things happen to Mac during his brief voyage and Pérez, with a team of inkers and colorists, have produced a memorable trip that is stunning from cover to cover. 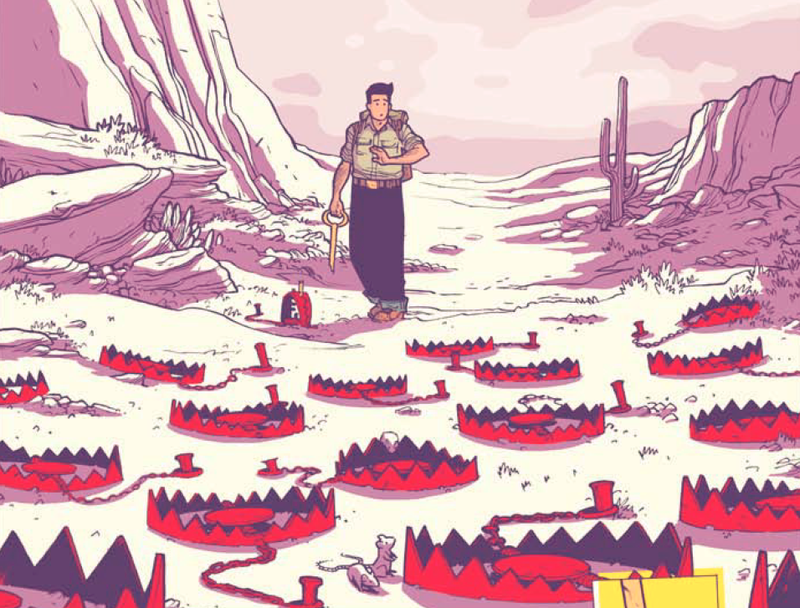 Mac finds himself facing a series bear traps in the middle of desert. The script to “Tale of Sand” film sits bluntly in the foreground of the opening page. Mac’s legs can be seen in the background. With one clenched fist and one palm open in front of him, Mac walks with great determination and purpose. Move to the next page and the script, edited by hand, fades into the background and is replaced with striking Southwestern landscapes. As Mac descends upon the town, the film script becomes a physical presence; it is tattered and glued to the side of one of the old buildings. Pérez moves past the script into a fully illustrated piece with minimal dialogue. Every artistic choice in “Tale of Sand” feels meticulous. When Mac first appears in town he is thrust into an enormous celebration where a jazz band is filling the partygoers with exuberance and joy. The movement, the elation, and the passion are all beautifully communicated through Pérez’s striking pencils. Perez’s characters suggest movement in a way that is reminiscent of the best animation. Every character on the page, while all dancing and celebrating, is treated individually by the artist. In one panel, Mac peers across the room suspiciously, Pérez fills the space with characters, all of whom are all enjoying themselves at varying capacities. One woman smiles with her friend, while another man’s side is splitting, and yet another man releases a dignified chortle. Henson and Juhl’s script is saturated with one odd sequence after the next and Pérez tackles the illogical twists head on. Of course Mac’s hide is saved by an early Twentieth Century hunter in the middle of the desert. Sure an ice deliveryman races across the landscape while struggling to carry an ever-shrinking cube of the cold stuff. And why wouldn’t Mac find himself in the middle of a brawl in a saloon with the previously mentioned linebacker and sheik? As straightforward a story as “Tale of Sand” is, the imagery and happenings are as abstract as all get out. Ian Herring, Pérez, Jordie Bellaire and Kalman Andrasofszky employ a mostly subtle pallete filled with washed out primary and secondary colors. 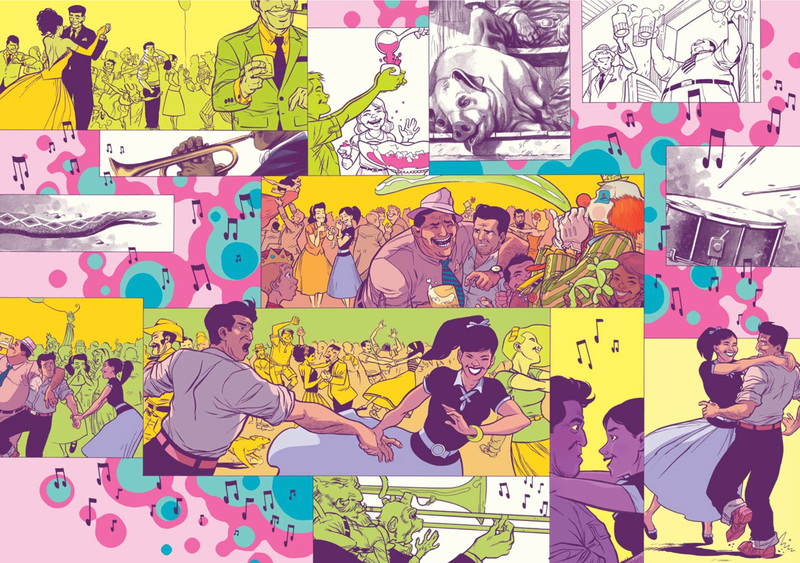 In many scenes only a few colors, and often one, are used to fill the panels. The schemes change from scene to scene, sometime dramatically, but for most of the story the colors utilized are simple and bring out the strength of Pérez’s layouts. There are also a handful of pages and backgrounds in which watercolors are utilized, adding another layer of atmosphere to the artwork. Pérez’s character work is expressive and he has a strong knack for body language. These techniques are invaluable with a piece such as “Tale of Sand” where there are long stretches absent of dialogue. Mac is your Hollywood everyman. He’s tall, dark and handsome, but he’s slightly shabby with his tussled hair and five o’clock shadow. Patch, his pursuer, is his slight opposite. He’s a tall slender man who exudes a sinister streak even when he’s smiling and toasting the strikingly gorgeous unnamed blonde who accompanies him. So just what is “Tale of Sand”? Is it a commentary on the aimless nature in which so many of us walk through life, not understanding what our goals are, but charging ahead nonetheless? Is it a second chance at a story that was dismissed, time and again, for its abstract qualities? Yeah, it’s those things. But it’s something else. Something special. “Tale of Sand” is a book that deserves to be poured over slowly to soak in every lovely line and the exquisite colors used to give the images life. It’s an imaginative work from a man who has, for so many of us, defined imagination. It’s a book that you will pull off of your bookshelf for no other reason other than to look at something beautiful.